Recently picked up an interested in Japanese doujinshi… Have to say that some doujin artists are really good and deserve the money. Stories are quite cute…with your favorite pairings :). The doujinshi circles that I’ve read/bought and have particularly liked so far are Waterfall, peachpulsar, Myao (Morinaga Milk), and Doropanda Tours (Nanzaki Iku). 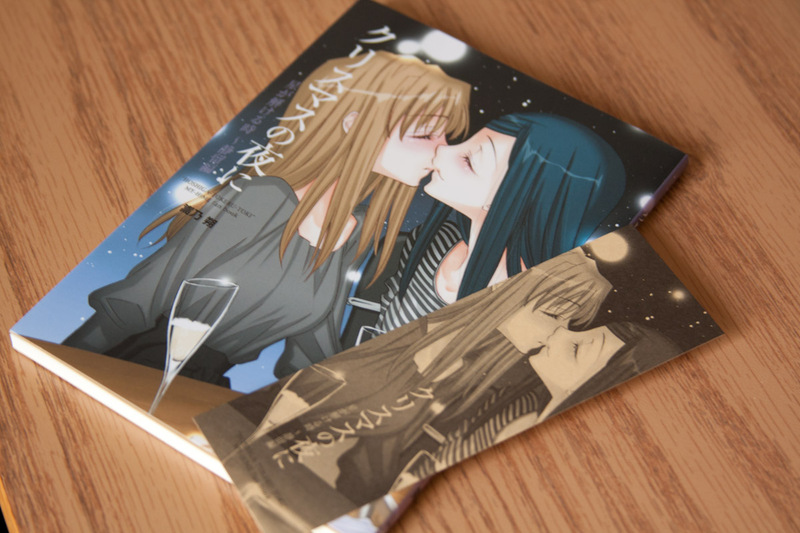 Waterfall also has some original yuri doujinshi, but I haven’t checked those out yet. They certainly look appealing and they’ve done quite a good job with the ShizNat doujins, so I will eventually give those a try too. Though the only thing that holds me back from buying more doujins is that I don’t have the resources to find/buy the physical copies in the US. For some, if I’m desperate enough, I could find it on Ebay or ask a Japanese forwarding service to get it for me, but both methods gets really costly (~$20-$30 per book). Alternatively I could purchase the digital copy through DLSite, but since I am a collector, I do prefer the physical copy at hand. If I am left with no choice, I will buy from DLSite, because I do want to support the artists. 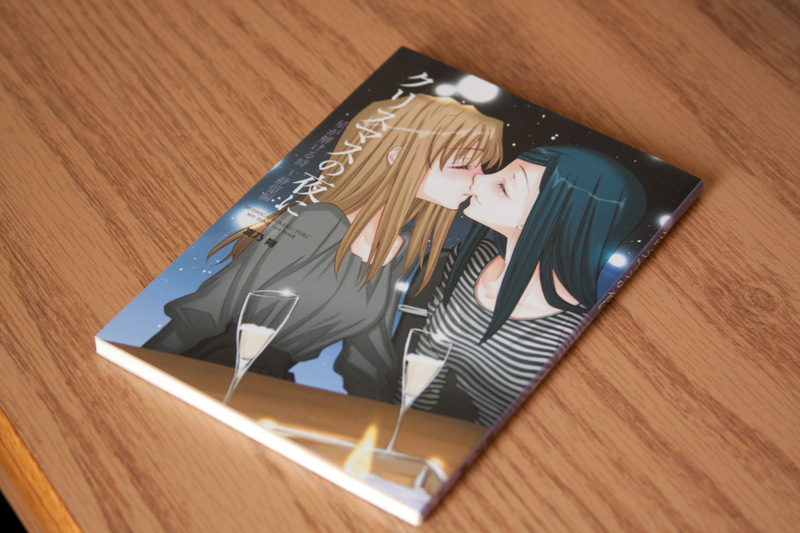 Anyway, I did manage to buy “Christmas no Yoru ni,” a ShizNat doujin by Waterfall from DoujinPress.com. The person in charge, Kira, was friendly to communicate with and ships pretty fast. Within days, my ShizNat doujin and Katahane book came with plastic wrap. The doujin was an A5 size book while the Katahane book was a A4 size, with fewer pages. 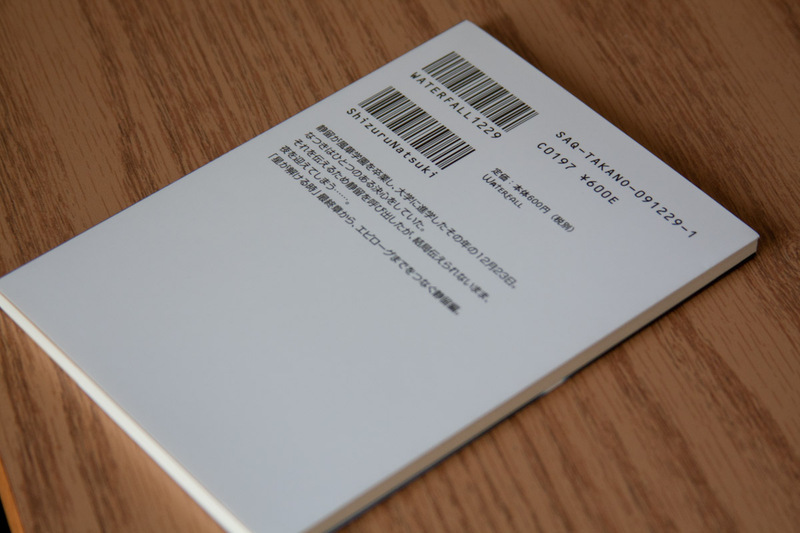 The ShizNat doujin even came with a small bookmark. I was so happy! I got the impression that doujin artists care a lot for their products and fans ^_^. I would definitely buy more Waterfall doujins and doujins in general, in the future (hopefully physical copies)! And when I go to Japan… I will be hunting down more good doujinshi! For now, I’m looking for more resources to obtain doujinshi in the states. Please refer to my page here for my suggested places to purchase Japanese manga/doujinshi/CDs/DVDs/others. This entry was posted in doujinshi, yuri and tagged circles, dlsite, doujin, doujinpress, doujinshi, japanese, manga, peachpulsar, shiznat, waterfall, yuri. Bookmark the permalink. Ahh, I love Nanzaki Iku’s ShizNat doujins and “Sweet Little Devil.” I haven’t gotten into doujinshi circles as much though I have stumbled upon quite a few since the time I grew to appreciate manga. My favorite bookstore to pick up manga that isn’t hot off the press anymore is Book Off. It’s basically a second-hand bookstore but the prices were a couple hundred yen cheaper which is pretty considerable when taking into account what they exchange rate is now. The USA branch has a few locations throughout California and Hawaii and one in New York City, however, no transactions or searches can be done online at this moment in time. You just have to physically go to a store. I’m a few hours away from NYC so, when I get a chance to head up there, Kinokuniya and Book Off are high priority on my list of places to visit. In the NYC store, I believed I picked up their only copy of the first volume of “Hanjuku Joshi” a little earlier this year, which was pretty awesome. Ah! I’ve been to both places. My residence is actually about an hour away from NYC so I visit BookOff/Kinokuniya every so often (ever since I was able to read more Kanji). I prefer BookOff a lot and have had very good luck finding Yuri there as you’ve also mentioned. (I found Kuchibiru Tameiki Sakurairo and Spring, Summer, Fall, Winter there and was so happy xD). Let me tell you a secret :x. Well, I don’t really know if it’s a secret, really, I just found out about it recently. I don’t think you’re really allowed to do this… Anyway, you know the drawers under the shelves of books at BookOff? You could actually open those drawers and you’ll find more stock that belongs to that shelf area (it’s usually the excess stock and sometimes, stock that’s not up there due to shelf space). I found extra copies of Spring, Summer, Fall, Winter there and compared the books to get the best looking one before buying it lol. Hm. Kinokuniya. I do visit this place every time I go, but I go just to check out things, not really to buy. I’m a bit disappointed at their stock for yuri, though they do carry a bunch of other mainstream manga. I usually don’t buy anything from there, as I think bk1 is cheaper, and I don’t mind waiting for my manga… Kinokuniya does have a good selection of Japanese stationary though :). <3 Nanzaki Iku. Aw, I'm waiting for my copy of "Sweet Little Devil" to arrive. I really miss being in NYC since I’m originally from the city. So many cool things to see and do that align more with my interests. I would go to Book Off and/or Kinokuniya all the time if I lived there. As far as the drawers underneath the shelves go, I’ve pulled them out on one or two occasions (particularly while I was studying abroad in Japan) but don’t really do it since I also was never sure if that’s actually allowed or not…lol. Oops? I would like to check some doujinshi circles a little more. I remember reading a cute, short tale Circle UKOZ wrote for Yuri Monogatari 5 that was very poignant and had excellent art, so I might start with them. Ah. There’s no free shipping for bk1 to the US, as far as I know. They do offer the cheapest available shipping option to ship to the US though, which is SAL (economy) shipping (non-registered). It takes roughly ~2 weeks to arrive, depending on where you are located. The rate is by weight. An estimate is ~3-5 dollars per book, depending on how heavy it is (regular sized manga books like Sasameki Koto would cost less than the “white” books like Kuchibiru Tameiki Sakurairo). bk1 they charge you exactly the price they pay to get the books shipped to you. Nothing there is marked up, which is what I like best about it. At places like Kinokuniya, YesAsia, the prices are marked up by anywhere from $3-6 dollars. And I think they also charge NY tax…which is quite a bit extra $ if you’re buying more than just a few books. The only reason I can justify buying at Kino is if I wanted something in hand ASAP. If it could wait, I just go with bk1. They have a points system and they send out 300 yen coupons (off orders of 3000 yen) occasionally. They also have a wide selection! I sound like I’m advertising for them now lol. Anyway, I totally recommend them. Christmas or not :P. Oh, but I heard you should avoid ordering from them around holiday season. They seem to get really busy and you won’t see your order for…more than just a few weeks. Whoa, you were able to find Sasameki Koto there? I only saw Volume 5 and 6 there…and was pretty disappointed they didn’t carry more :/. By the way, can you check your email?